A unique complex devoted to science and culture. The City of Arts and Sciences is an architectural, cultural and entertainment complex that has become a worldwide tourist attraction. It is a unique complex devoted to science and culture. 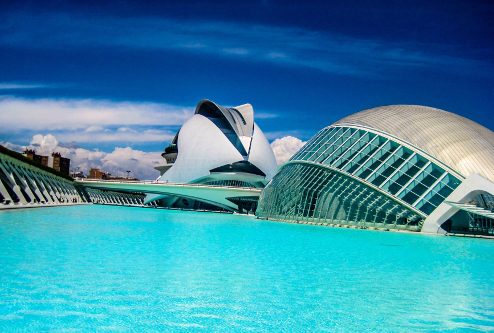 Designed by Santiago Calatrava and Felix Candela, The City of Arts and Sciences was inaugurated in 1998 and it represents a spectacular example of modern art. 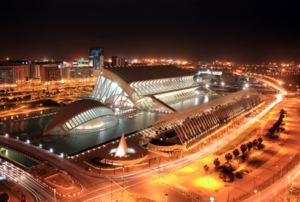 It is situated at the end of the Turia’s riverbed and is one of the most important modern tourist destinations in the city of Valencia. L’Umbracle is a small urban public garden that forms part of the City of Arts and Sciences. It stands out as a modern construction in which a series of parallel arches cover a long and narrow garden of palms and other Mediterranean plants from which you can see all the buildings, ponds, walkways and gardens of the City of Arts and Science. L´Hemisfèric was the first building to be completed in the City of Arts and Sciences, opening its doors in 1998. It is a building designed by Santiago Calatrava and has the shape of a giant eye. It contains an IMAX Cinema and a planetarium. Museo de las Ciencias Príncipe Felipe is an interactive museum dedicated to science, technology and the environment. El Palacio de las Artes Reina Sofía is the opera house in Valencia and an arts center that houses many events such as opera, theater and music in its auditoriums. L’Àgora is a covered plaza designed to hold events such as concerts, exhibitions, conventions and international sporting events.